Need motivation and want to improve your health and fitness in a friendly and non-threatening environment? 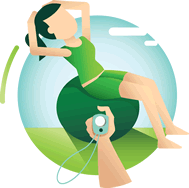 Our personal trainer will challenge you in a supportive way to help you to reach your goals. Our group personal training sessions are small enough to have personal interaction with the trainer but still have that group camaraderie to keep you motivated. Why should I join small group personal training sessions with EvolvME? If you consistently attend small group training you are more likely to achieve your goals. Why? It’s about accountability… you’re more likely to show up to a group session and commit to exercise than being left to your own devices when no one is watching! Groups build motivation and help you to adhere to exercise – plus it is fun! You can make your personal trainer MAKE IT FUN! Working out with a friend is fun, plus let’s face it some of us are competitive and will challenge ourselves in front of our peers, this can be healthy competition if guided. Looking for One-on-One Personal Training? Please see our Personal Trainer page for details on one-on-one personal training. Packs must be paid for in full at your first training session. Please call our team on 1300 036 569 to book your TrainME small group personal training or fill out the enquiry form below if you would like us to contact you for further information. If you have any questions about the TrainME personal training program, please fill out the details below and we'll get back to you as soon as possible.